Vocal skills are amongst the first few skills (besides visual, gross motor etc) that embark another milestone for a baby. With our kids, we have been hitting developmental milestone related to vocabulary development pretty well (knock on wood!). By the age of 1, their vocabulary comprised approximately 15 words and by 2, it grew to almost 80 words. While early language development is a growing concern amongst parents these days, I thought I must share a few handy tips on how to develop vocabulary in toddlers. We often don’t realize the importance of a robust vocabulary. Although vocabulary acquisition may not be in the forefront of our minds, we notice the effects in our children when it is lagging or absent. If our children don’t understand the words that they hear, speak, read and write, they will become ineffective communicators and struggle with many daily tasks. 1. Read aloud to them! When we read to our children, we are exposing them to words they may not otherwise hear. They are taking in new words and ideas and very often asking me questions about what they are hearing! So when it’s time to pick up a book for the nightly bedtime story, remember that you are not only creating lasting memories, you are also developing vocabulary! However, don’t rush through the pages for the sake of finishing the book. Make it interesting and more impactful by playing with tones & pitches, such as a gruff bear voice or a squeaky mouse one —so your child can copy you and practice different sounds and pitches. Picture story books that are filled with photos and words are fantastic for building up word knowledge. Before you know it they won’t just know what a ‘bird’ is, but they will be able to identify toucans, eagles, budgies and more. We found Priddy books to be really helpful in this category. I have mentioned these under the 5 must-have books for Infants as well. Read more on that here. Choose books with stories that are rhythmic & repetitive. Children learn new words and pronunciations through repetition & reinforcement. One good choice for this age group is Brown Bear, Brown Bear What Do You See? by Eric Carle. Click here to know more. 4. Don’t shy away from ‘big’ words! It can be so easy to think, “my child won’t know how to say python, so I’ll just say snake” but children can absorb more than you think. Even if they don’t say it correctly just yet, it will come in time and they will already have the word knowledge to back it up. If you feel it’s too complicated for them to understand, tell them anyway! And try not to simplify too much. 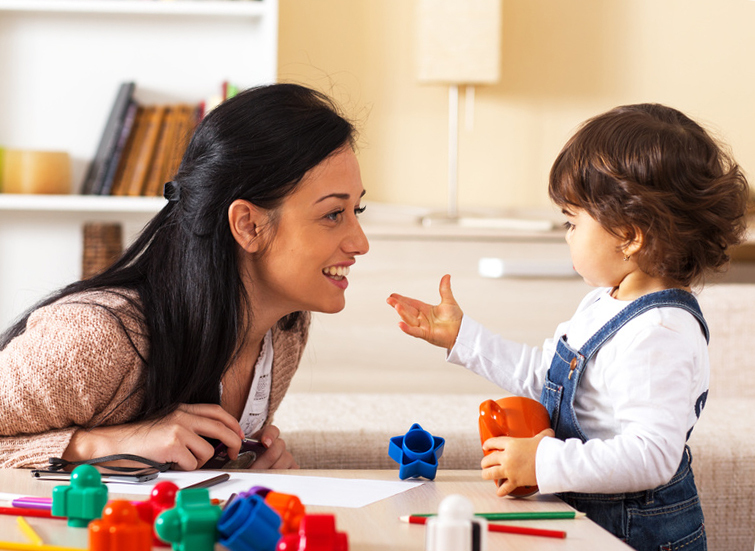 Language exposure is the key to develop vocabulary in toddlers! Most preschoolers know all the names of dinosaurs that most adults can barely pronounce. Their minds are like sponges. Avoid ‘baby talk’. Introducing incorrect words just for the sake of making it simpler for your child, hampers their ability to grasp new words. From cupboard shelves to chairs to refrigerator- you can label anything in the house. Give your children as much vocabulary as you can. They will probably remember the big words most easily because shorter words with similar letters like “was” and “saw” and “which” and “when” are confusing. Never underestimate the importance of a good conversation and information to the development of vocabulary. But beyond talking, listening to your child is equally important. I need to remind myself of this one sometimes. Especially if I’m trying to get through a day on little or no sleep. And I end up completing their sentences! Encourage children to describe what they see. Typically when we point out objects to young children, for example a cow, car, boat, etc., we get stuck on nouns. Invite descriptions including shape, color (adjectives) and movement (verbs). Talk about what you see, smell, taste, touch, and hear. Singing slows down language so your child can hear the smaller sounds in words. Songs introduce new words in a fun and playful way. Use a variety of words to describe things; don’t just use “good” and “nice.” Think beyond the regular adjectives. A snack can be many things: good, healthy, yummy, crunchy, round, etc. Take each new experience you have as an opportunity to learn new words. When you visit a supermarket, talk about trollies, counters, queues etc. When you make a new recipe, talk about woks, cooking oil, soy sauce, spices etc. Take advantage of time in the car to practice word play, pointing out objects of interest as you talk about them to help provide immediate context and explanation. Describe things that are happening as they are happening. Children have been shown to learn words more quickly when they can see and feel the object, as opposed to an abstract word with no apparent context. Reflect back what children say to you. When children are pointing at people or objects, validate and name them: “Yes, I see the black dog! His tail is wagging.” This confirms their experience and affirms their ability to have a successful conversation. 12. Don’t make a big deal about speech mistakes. There is no need to correct your child. Simply repeat the correct pronunciation. If your child says, “champlin”, you might respond by saying, “Yes, my little boy is a Champion” to give your child a chance to hear how the word sounds. Correcting your child can make him less likely to try saying new words. Playing with your tot gives her a great example of how to play. Plus you can teach many vocabulary words at this time. Make-believe play is a great way to encourage social language. You can have a ‘tea party’ with your child, a ‘visit to the doctor’ or a ‘picnic.’ Use the appropriate words, do the actions and tell him what you are doing (for example, “I’m pouring tea into a cup”). It is also important that toddlers have some time to play by themselves. This gives your toddler a time to practice language on her own and explore different items that seem interesting. This also allows her to explore her own imagination as she directs the play. This verbalisation time is very important. Take your child on outings to learn new objects and actions. Verbalise what he does and sees, and repeat it often, even after returning from your trip. A good idea is to take pictures while on your outing and later look at them, encouraging your child to tell you what he has learned. Language development starts very early in life. A foetus can hear from five months after conception, so it’s important to stimulate your child’s speech development from a very early age. Hope these tips come handy for your & your little one!